Do you have seafood allergies but still want to enjoy a hot bowl of gumbo? We also used brown rice to give this chicken and sausage gumbo recipe a bit of a healthier twist. Try out this healthier, hearty, no-seafood gumbo at home. Don’t feel overwhelmed by the number of ingredients in this recipe. It’s mostly spices and aromatics which are readily available in your pantry at home. If you feel that making gumbo is time-consuming, you can make it ahead on a Sunday or on your day off. Place it in an airtight container when cooled, then freeze the gumbo for storage and just reheat and serve later on in the week for your dinner. Combine paprika, onion powder, garlic powder, salt, pepper, oregano, and flour in a bowl. Set aside. Heat olive oil on medium heat. Sauté onions, bell peppers, celery, Hungarian sausage, and garlic until tender, about 2 to 3 minutes. Take out the sautéed vegetables and sausage and set aside. In the same pot, heat more olive oil if necessary. Coat chicken pieces in seasoned flour, shaking off excess. Set aside remaining flour. Pan-fry chicken in batches until golden brown. Set aside. Add reserved seasoned flour to the same pot and stir over low heat to make a roux. Cook until the paste is the color of peanut butter. Stir in sautéed vegetables, sausage, tomatoes, and bay leaf. Slowly add stock or water, stirring well to prevent lumps. Bring to a boil. Add chicken, okra, thyme, and rice. 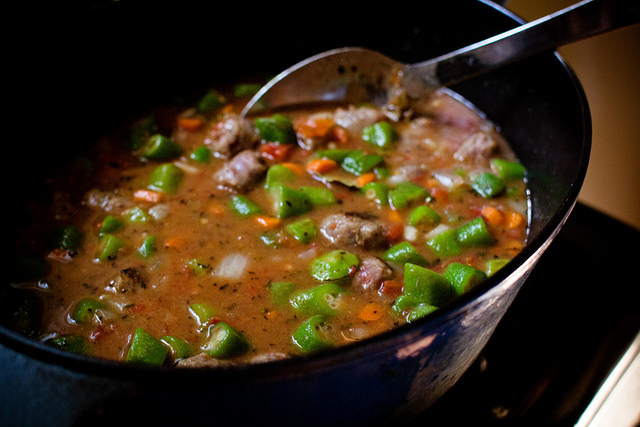 Cook over low heat until rice and okra are tender, about 30 minutes. Taste and adjust seasoning with salt, pepper, and cayenne pepper. Remove bay leaf after simmering. Transfer to a serving bowl and garnish with parsley. Serve hot. A lot of soup recipes require spices and other types of aromatics to bring out the flavor, so it’s best to purchase them in bulk. Whole Foods has a great selection to choose from at affordable prices and they are organic. Just make sure you put the spices in an airtight jar to avoid losing potency and last longer. Have you tried a no-seafood gumbo? Let us know your thoughts in the comments below!